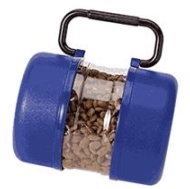 Complete transportable pet feeding system. Airtight - Keeps food fresh. Easy meals on the go. Complete transportable pet feeding system. Airtight - Keeps food fresh. Easy meals on the go.